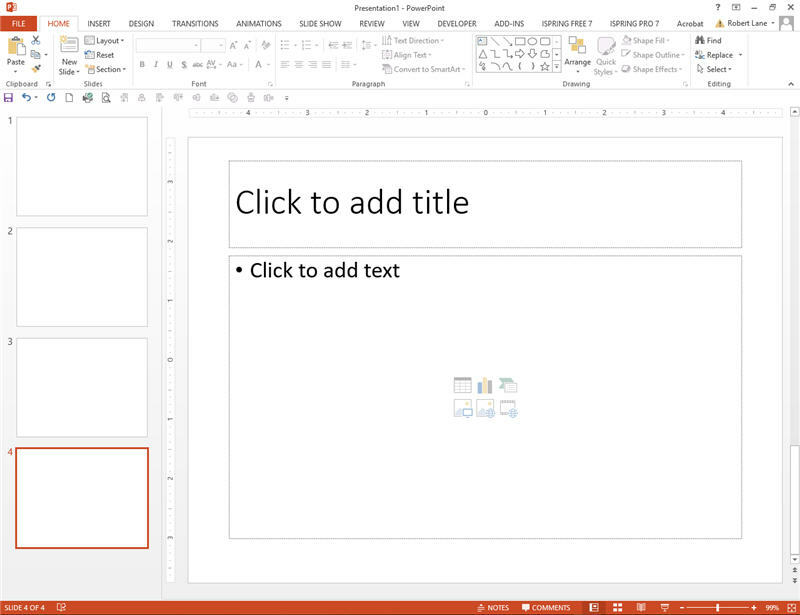 Inline Navigation features a strip of navigation at the bottom of all slides in a single PowerPoint show. 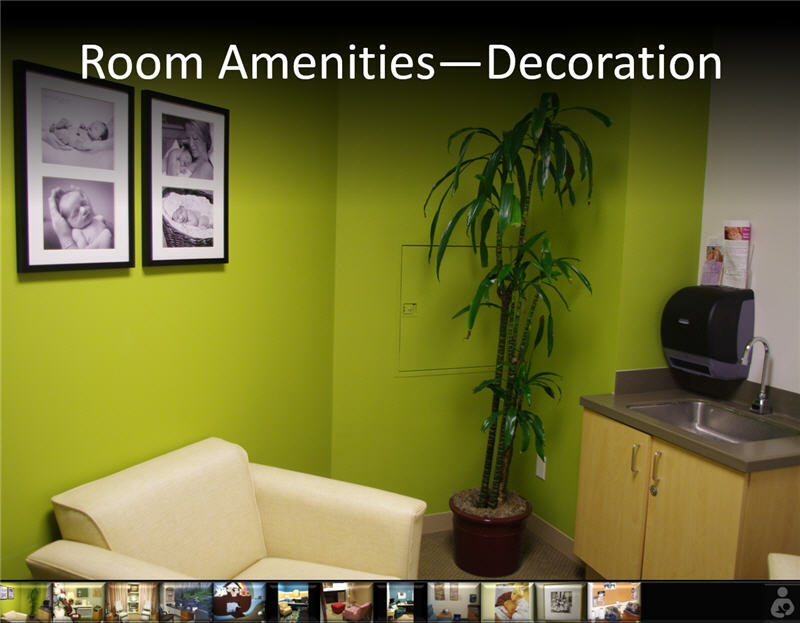 A presenter, while the slide show is running, can click any link on any slide and instantly jump to a desired location. The navigation strip has one link associated with each slide. In the screenshot below, for example, notice there are only four navigation buttons. That means this slide show contains only four slides. The speaker can access any slide … from any slide. 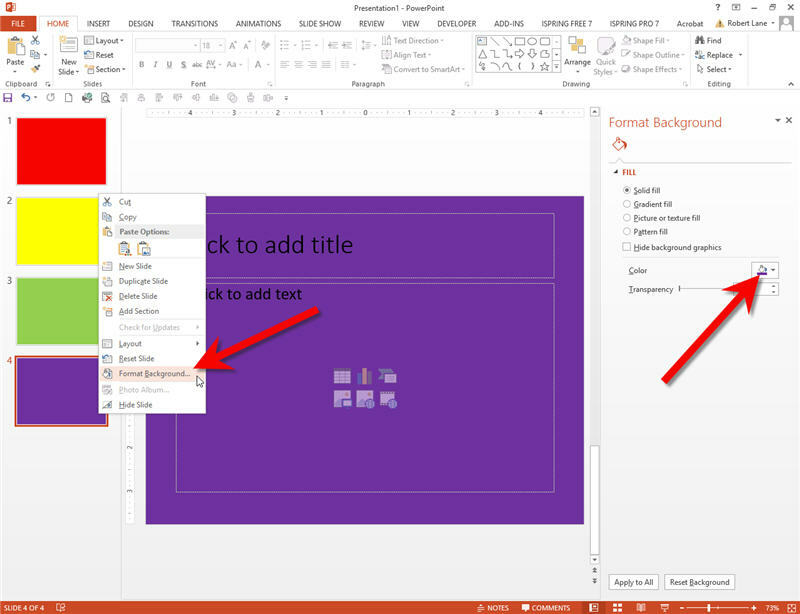 You’ll normally construct navigation buttons in either of two ways: from PowerPoint shapes or image thumbnails. The screenshot below highlights an image thumbnail example. 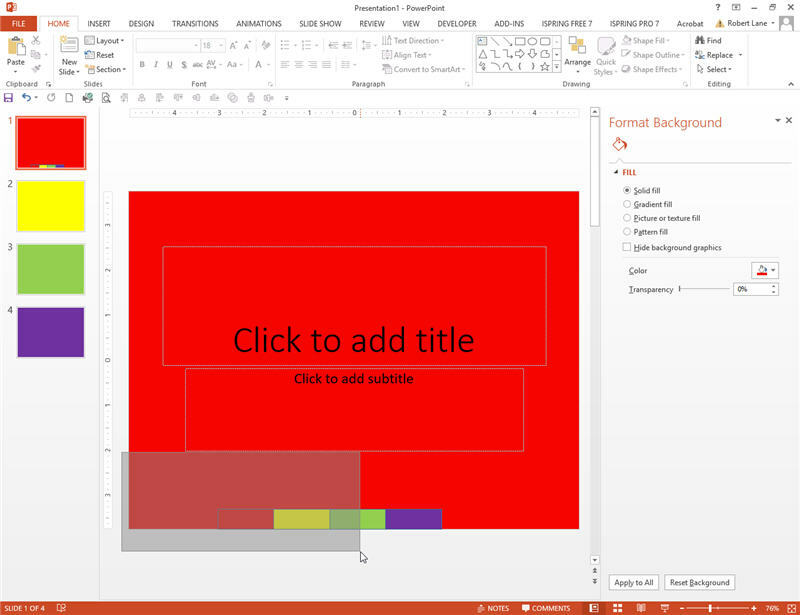 In this tutorial, however, we’ll stay with the simplest option—PowerPoint shapes. Let’s build a simple example. Make a new slide show and add three additional slides (to have a total of 4). 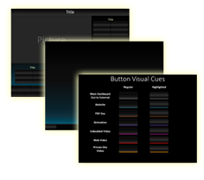 Starting with the first slide, right-click its slide thumbnail and choose Format Background from the menu that appears. 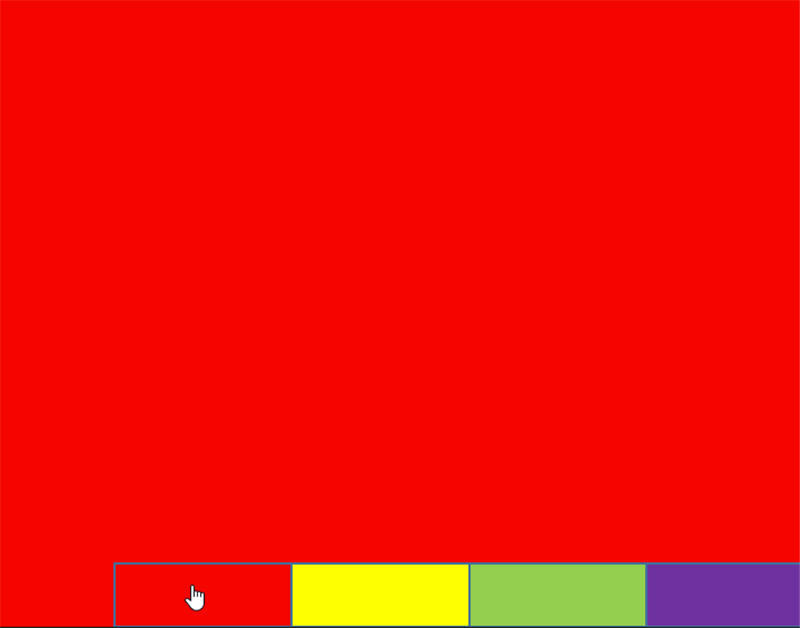 Then on the Format Background panel displaying at right, click the Color button and select a red color. Change the color of the remaining slides to yellow, green, and purple respectively. We’re making these color changes simply to verify later that our navigation buttons are working properly. Return to slide 1 by clicking its slide thumbnail. Then click the Insert tab on the Ribbon at top of your screen. Click the Shapes button and then click the Rectangle icon on the menu that appears. The cursor now changes to a “plus” sign, meaning it’s ready to draw a shape on the slide pane. Left-click the slide pane and leave the left-click button held down while dragging the mouse sideways. A rectangular shape begins to form. Make the shape approximately 1/2 inch tall and 1 inch wide as shown below. Release the mouse button to complete the shape. 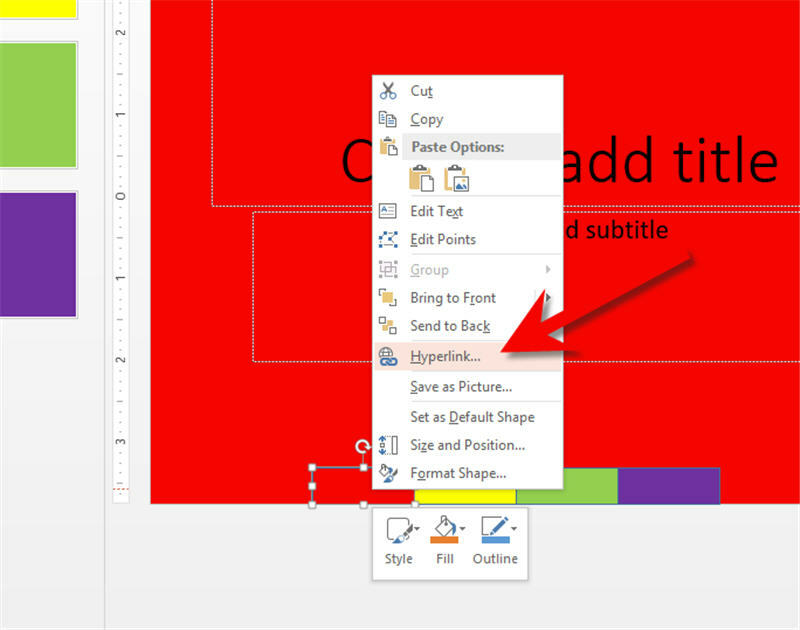 Move the shape to the bottom of the slide pane. Hold down the Ctrl and Shift keys simultaneously while left-clicking and dragging this shape sideways. That action produces a copy of the original shape and keeps the copy perfectly in line with the original shape. Repeat the same actions two more times until there are four shapes side-by-side at the bottom of the slide. Right-click the first shape and choose Format Shape from the menu. On the Format Shape panel at right, click the Color button and make this button the same color of red as slide one. Give the second button a yellow color, the third button a green color, and the last button a purple color. We’re making these buttons the same colors as the respective slides so that they provide a visual cue (preview) of what we’ll see after clicking each link. Remember, so far we are still working only on slide 1. Now we are ready to add the hyperlinks to slides. Right-click the first shape (the red one) and select Hyperlink from the menu that appears. On the Hyperlink Dialog box, click the Place in This Document tab. 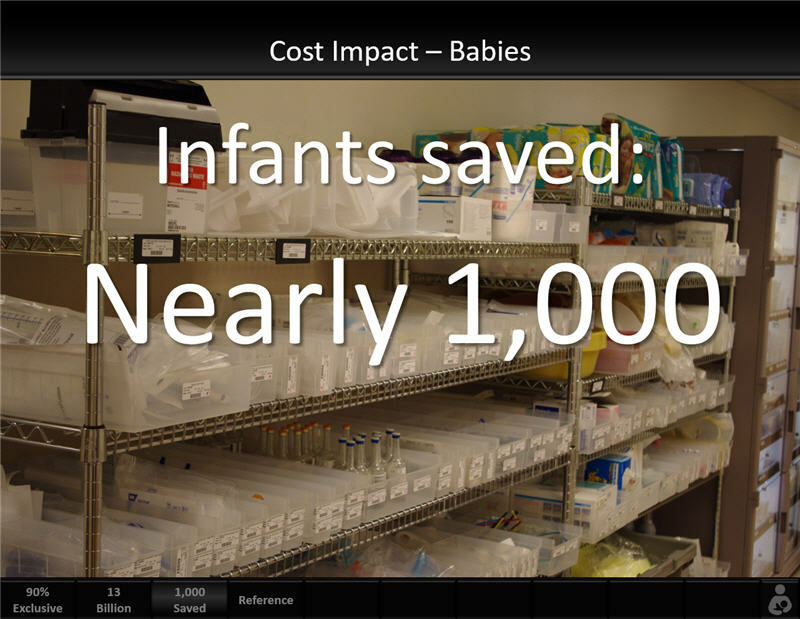 Then click the Slide 1 label. A preview of slide 1 appears at right. Finally, click OK to close the dialog box and finalize the link. Repeat the above procedures with the other shapes so that shape 1 is linked to slide 1, shape 2 is linked to slide 2, and so forth. The result is a fully working strip of navigation on slide 1. 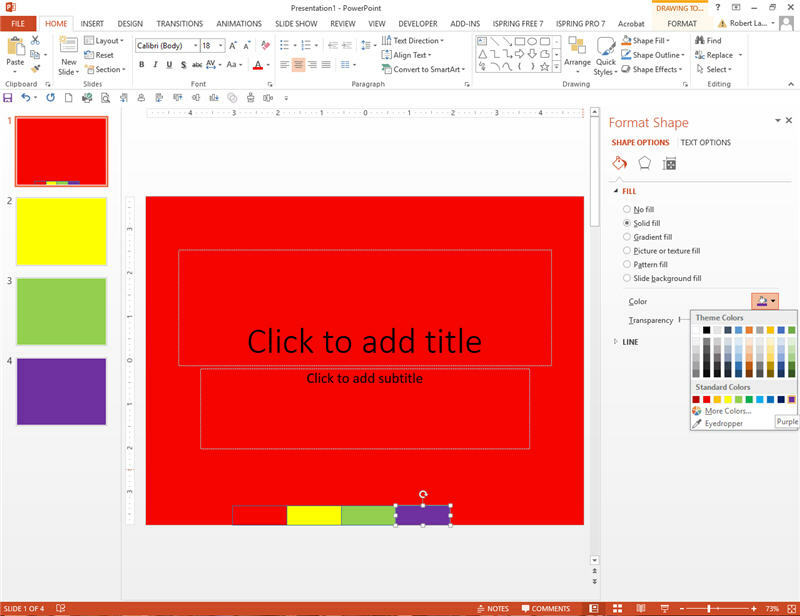 Start the slide show on slide 1 and hold the cursor over any of the bottom shapes. 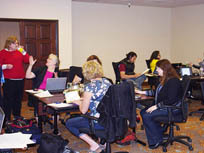 See that the cursor changes to a pointing hand. That hand indicates an active hyperlink. Click the purple shape to directly access that slide. 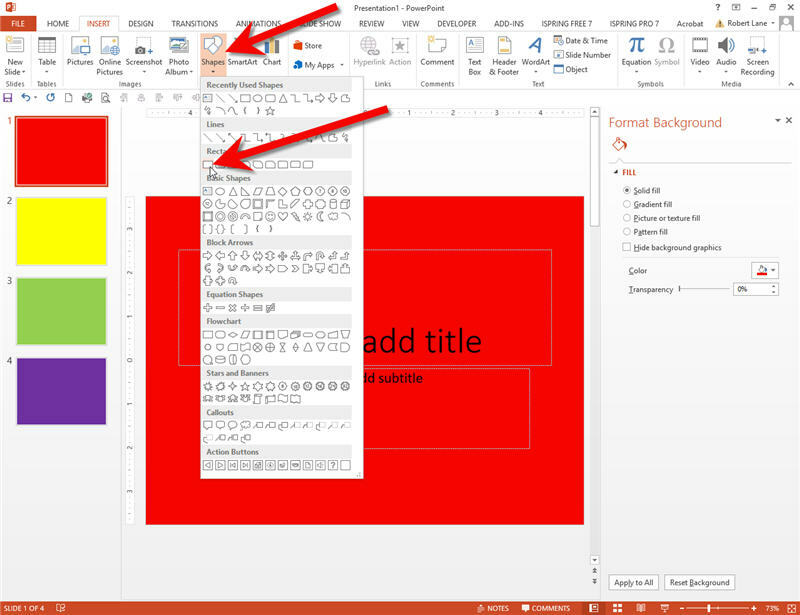 Special Note: PowerPoint hyperlinks only work in Slide Show Mode. If you click any of the shapes while in Edit Mode (when the slide show is NOT running), that action does nothing more than select the shape. Therefore, if links don’t seem to be working, be sure you have the slide show running. Once on the purple slide, press the Escape key to end the slide show and return to Edit Mode. Perhaps you noticed a problem after clicking the hyperlink a moment ago. The link took us to the desired slide (hopefully, if it was set correctly) but after arriving at that slide … then what? We were stuck there. The purple slide didn’t contain a similar navigation strip, and thus we had nowhere else to go—no way to get to another slide. That’s not good. In a dynamic presentation context, you never want to be stuck on a slide without some form of navigation that allows movement to another location. We’ll solve this problem by creating an optical illusion. 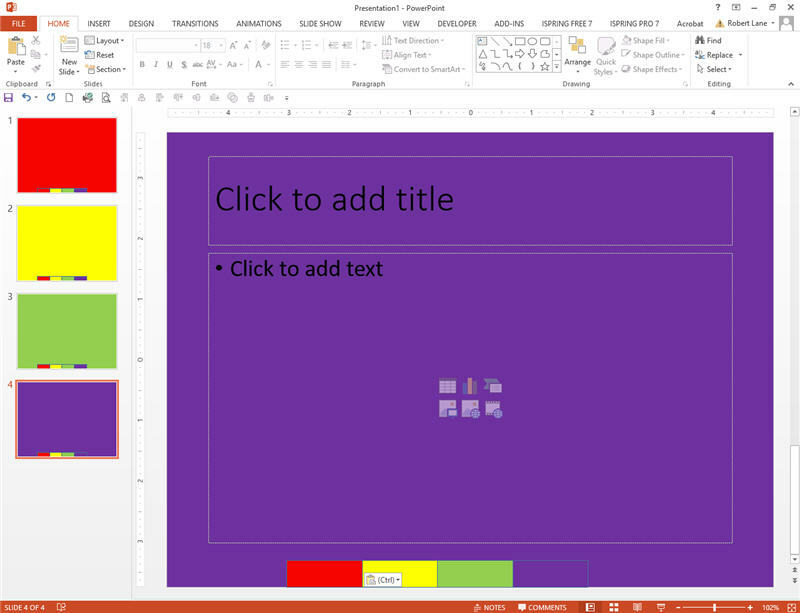 The final step is to copy the strip of navigation on slide 1 and paste it onto the remaining slides. Start the process by returning to slide 1 and then left-clicking outside of the slide pane (in the gray area) and leaving the mouse button held down while dragging the mouse across and over the entire navigation strip. This action produces what’s known as a Selection Net—a semi-transparent blue or gray box that forms as you drag. After this box completely surrounds the navigation strip, at that point you can release the left mouse button and all the shapes inside will be simultaneously selected. 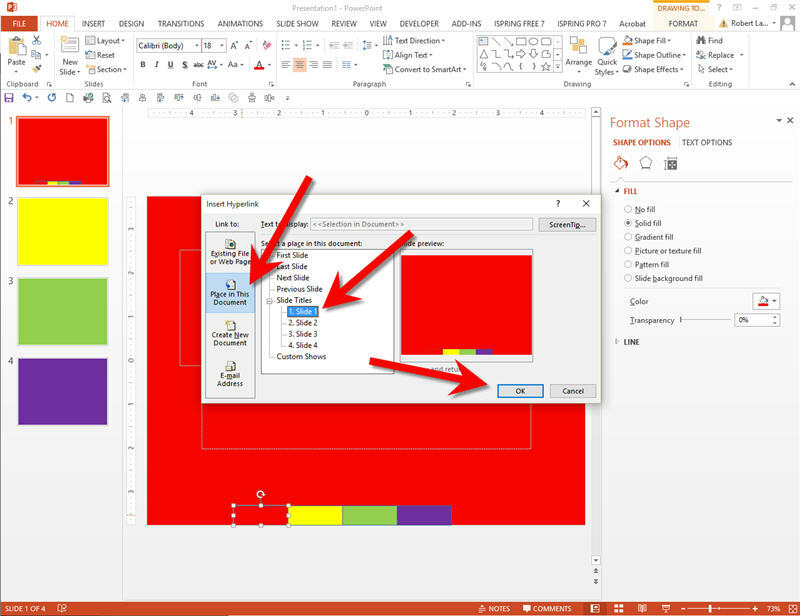 With the shapes selected, right-click somewhere within the selected area and chose Copy from the menu that appears. Once the shapes are copied, move to slide 2 and paste the entire navigation strip there. Then paste the same strip onto slides 3 and 4 as well. Start the slide show again and see that PowerPoint pasted the navigation strips in exactly the same place on all the slides. As a result, now when we click links to move around between the slides, the navigation area appears to be perfectly stationary, as though it is a single strip fixed in place. This is that illusion mentioned a moment ago. The strip “appears” to be fixed and universal throughout the show, but in reality it has a different instance on each slide. The fact that each instance occupies the exact same location on every slide is what forms the illusion. Make sure all the links work properly and save the show. This same kind of navigation, in a slightly more complex form, is what makes fully dynamic PowerPoint presentation possible. You’ll eventually build what’s known as a presentation platform that enables seamless movement between any slide, in any show, even if your content collection contains hundreds of separate slide shows. 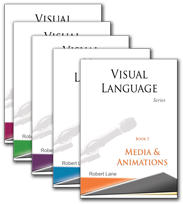 That’s the process we call Visual Language.